Recent survey findings reveal the latest challenges and priorities facing contact centers in 2017. In late 2016, we conducted a simple survey identifying the biggest challenges and top priorities for 2017. Participants could identify three of each, with no ranking. Input came primarily from contact center leaders (48%), along with corporate executives (14%), support analysts (9%), supervisors (8%), consultants (8%), sales and marketing (5%), IT (4%), and a smattering of others. This is our second year conducting the survey, and our contributors jumped to 486—thank you! Figures 1 and 2 show the nice cross-section of industries and distribution of sizes we achieved. Everyone wants to know what challenges people face overall, and within their center size and industry. There are so many possible changes to pursue, not to mention the barrage of input from various industry sources. As such, it’s invaluable to learn what priorities are really making it to the top of “to-do” lists. Figures 3 and 4 give you the results, including our categorization of the items. But again this year, we won’t stop at a few charts. We’re going to share our assessment of the results and what they tell us about centers and about our market. We’ll look at trends by industry and by size (Figures 1 and 2), contrast this year’s input with last year (we tweaked a few items based on industry changes and “Other” input that we received last year) , and weave in some commentary on what we think might be behind the results based on our project experience. The difficulties in any center often surround workload (too much of it) and performance (not meeting a variety of goals). Many of the challenges we list reflect the two sides of that coin. It is easy to think the center holds all the keys, but those issues didn’t dominate the upper tier of the list. The diversity of top contenders suggests several potential root causes as well as opportunities to improve through collaboration between the center leadership and their counterparts in IT, HR, Finance, Marketing, Product Management and other areas. The challenges reveal a diverse top tier across staffing, strategy and technology. The top two remained the same as last year. Attrition was again the No. 1 challenge as cited by 21% of the participants. It’s an age-old problem that plays a major role in saturated markets with ample opportunities to go elsewhere, whether for a little pay bump, less stress or a new opportunity. Poor cross-departmental collaboration repeated as the No. 2 challenge with a 16% “hit rate” among participants. This finding also came as no surprise. Increasingly complex contacts boost staff reliance on IT (and the tools they deliver and maintain) and back-office functions. And marketing and product people have never had more impact on what triggers contacts. With the momentum of goals like “omnichannel” clearly revealed (channel addition and integration is the No. 3 challenge) and the quest for seamless, integrated customer experiences, departments must find a way to work together on behalf of the customer in spite of separate budgets, tools, processes and knowledge sources. In line with that observation, it is interesting that desktop tools moved up and ahead of self-service tools this year. CRM, knowledge management and a better desktop are key enablers to address omnichannel challenges. There’s a clear connection between the lack of understanding and respect for the center’s role and no budget approval for additional staff. Not much further down the list is the lack of budget approval for technology. We’ve seen the disconnect between the importance of the center’s role (and its corresponding accountabilities) and the funding it receives countless times. That lack of understanding may be at the heart of the issue. Meeting service level and average speed of answer were in the top four last year and have plummeted to the bottom third. Our first thought was the high percentage of financial services this year might have influenced that result, implying they are meeting their targets. However, in 2016 we ran a broader survey for credit unions and asked these same questions. For them, this was the fourth highest challenge. So this mystery will remain unsolved. We hope it’s a good sign for customer experience, not just that these issues have been overshadowed by others! As we slice the data by industry, we find attrition the far and away winner at over 20% across diverse industries. As might be expected, over 50% of outsourcers identified this challenge. Healthcare and Professional Services felt less of a pinch, with less than 15% listing it among their top three challenges. Desktop tools, self-service, collaboration and channels were named by more than 20% in five industries. Beyond those observations, the challenges by industry vary as much as the industries themselves. Table 1 shows the top challenges alongside the top priorities. We’ve highlighted items that represent a repeat from last year’s results. The adjustments in many industries may indicate sufficient progress in former “pain points” that they’re able to move to other initiatives. Attrition again rules the roost, with widespread impact on centers over 50 seats. The smallest centers may retain agents better but routinely can’t get the respect they need and deserve. They suffer increasing volumes and high abandon rates. A notch higher at 26-50 seats, the omnichannel challenge looms large, as it does for the largest centers. Table 2 shows the top challenges by size and includes the 2016 leaders for comparison. Attrition and self-service remained top issues for many size centers, while the other issues jostled around for top billing. The top priorities focus on performance and technology. It’s no surprise that many want to improve coaching and development; that is a common pursuit we see in client projects and a top factor in tackling the No. 1 challenge, attrition. Interestingly, self-service tied for first this year even though it moved down the challenges list. Training, a low-ranked issue both last year and this year but one we frequently hear, moved down the priority list this year but still makes the top five. The top of the list is rounded out by a focus on reporting and analytics tools and processes, along with performance management. Knowledge management and process automation are the next priorities in another well-coupled pair. These are key factors in targeting the challenges of increasing volume and handle times. Interestingly, some of the top challenges only get attention in the middle of the pack for omnichannel, CRM, and awareness and collaboration with other departments. Overall, workload and performance, plus technology, seem to be the focus. Strategic initiatives do not make the top of the list for most. The tactical often swamps the strategic in centers of all sizes and verticals, so they pursue projects that yield tangible improvements and near-term benefits. The results may also reflect the realities of the Rodney Dangerfield syndrome (“can’t get no respect”), leading centers to throw in the towel on initiatives that might require attention outside of their boundaries. Last year, about 1 in 10 wanted to refine hiring and hire more frontline staff, but 17% fewer seek to hire additional staff this year. Home agents have made it to the top of 33% more people’s lists. We see a bit of a flag in that only about 2% put support resources as a priority (compared to nearly 8% last year), and many of the important technology initiatives won’t deliver as much business value without them. In our experience, centers don’t have the resources they need to optimize the use of their applications. Three priorities are predominant (over 20%) in nine verticals: reporting and analytics, performance tools, and self-service. Process improvement, performance management, coaching and development, and training also rank high for many (6-7) verticals. And unlike the challenges, most verticals have a common collection of high-priority targets. 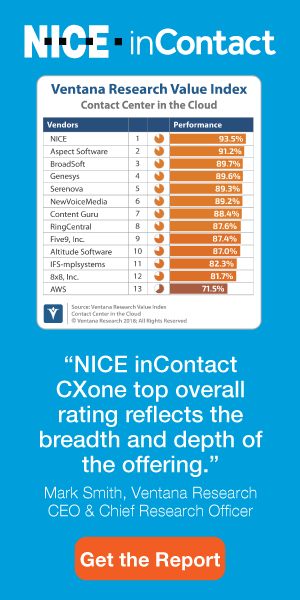 Perhaps this shows competitive insight into what most needs “fixing” within that industry’s contact center operations. The main exception is Utilities with a wide-ranging list of priorities: only self-service and desktop improvements made the top three for more than 20%. Telecom and Healthcare are the next in line in diversity of priorities. Self-service jumps out as a common high priority (over 20%) across centers of all sizes except those below 25 seats. The focus on coaching and development is not universally a top priority, with a gap arising in the 51-250 range and the smallest and largest centers having the greatest focus here. The smaller centers (under 100 seats) put greater priority on training as they did in 2016. They are also more likely to pursue more frontline hiring in 2017. The largest centers (1,000+) do not seem as concerned about improving training or performance tools as their smaller cousins. Not surprisingly, those mega-centers have the loudest message on the need to improve interdepartmental collaboration, while the smaller centers (50 and under) put more emphasis on raising awareness of the center’s role and impact. Figure 5 provides a snapshot view of the alignment—or lack thereof—between challenges and priorities. One thing is loud and clear: Attrition again stands out alongside Coaching to help tackle that issue. The misalignment shows up on collaboration and omnichannel with the priorities addressing those needs only showing up in the mid-range. And, self-service and performance tools are prioritized over other technologies, in spite of the fact that the challenges are higher for desktop tools. Last year, I commented that perhaps some of the misalignment points to the difficulty of “fixing” things outside the center’s control. That issue is still apparent, although the opportunity for self-service to address many challenges, including increasing workload, rose above the hurdles this year. Collaboration obviously relies on engagement of other departments and may feel like an overwhelming task to many, so they narrow their focus and forge ahead. Omnichannel is the new incarnation of multichannel and cross-channel, which I believe didn’t get as far as envisioned because of factors outside of the center’s control and in the hands of IT, “digital channels,” marketing and others. To avoid a similar outcome, companies are going to need to find ways to create a common vision of customer experience across channels and engage all the right stakeholders to make it happen. The good news is that the priorities identified show that contact center leadership recognizes their most valuable asset, their staff, and will work to give them tools, training and development to succeed. Let’s hope that pays off in newfound respect for the center and engagement from other departments in helping to achieve strategic, customer-focused goals. We’ll plan to ask the same questions again at the end of the year and assess changes and trends. We hope you’ll participate and tune in. In the meantime, go tackle those priorities and make 2017 the year of the contact center in your company!